The Exchange is a local business center covering central England. They came to Chip Web Design looking for an update on their original website which had proved going online was worthwhile. This design would take the next step and provide a professionally built website that is attractive and easy to use. 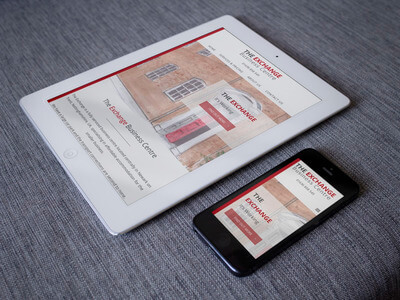 We worked closely with The Exchange to create the vision they had for their company website and continue to roll out updates to help increase the coverage of the website in the search rankings. A good mobile adaptation is always important for business websites because a large percentage of hits are from mobiles so we made sure the important details were availble in view and quick to load.